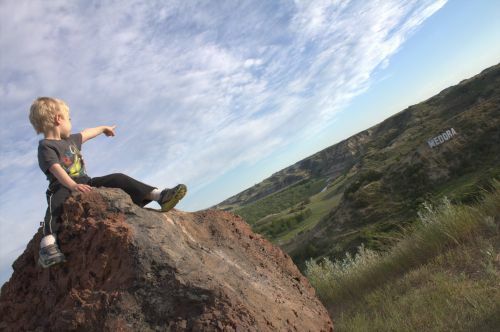 News that Governor Doug Burgum has big plans for a large scale (Theodore Roosevelt) “TR Library” to be plopped down on the tiny scale confines of Medora, ND, so charmingly created by the vision of Harold Schafer and his family, has me somewhat confused. News, also, that Burgum’s “private sector, big bucks backers” may, with the blessings of a compliant North Dakota Legislature, include the Walton family of Walmart fame and notoriety, raises even more questions. Who actually benefits other than, of course, those who might seek benevolent branding for their enterprises in the patriotic glamour of our “Bully Pulpit” President? High Plains Reader: Hello dear friends. I have been perplexed with an ad by the “Brighter Future Fund” (Bismarck Tribune, 03/26/19), which claims to be bringing “more than a library” (a Theodore Roosevelt Presidential Library and Museum) to Medora. From what I hear, and have seen in many trips out there, Burgum’s “more than a library” is MORE than that small town and its citizens can handle. However, the nearby university town of Dickinson, with its many accommodations for Summer time visitors to Medora’s charms, is ideally suited for the placement of a large library campus suitably honoring President Teddy Roosevelt, with the possibility of a smaller scale “extension museum and library” in Medora proper. What exactly is Governor Burgum thinking? Putin: He isn’t thinking; he’s just selling something that sounds good, and leaving the details until later. All the better to bring in those “big bucks” from foreign investors in North Dakota land, and, of course, what lies under that land out west on the Bakken. Rasputin: As of March 24, 2019, Governor Burgum hasn’t even been to the huge swath of land adjacent to the Little Missouri flood plain, designated as the “Governor’s Choice,” which will, by the way, displace dozens of Medora citizens from their households. HPR: The bright minds at the “Brighter Future Fund” also inform us that this new “more than a library” will be built “next to North Dakota’s #1 tourism attraction, the Theodore Roosevelt National Park.” I get that part, but if Medora already is #1 for tourists in North Dakota, of what use is an expensive and expansive library? Most folks bring but one book at a time to a place with other attractions than reading. Besides, the Western Edge Book Store already provides reading fare that is tailor made for once and future visitors to this Western themed town. However, as an investment in Higher Education, and year round interest in public history, like our amazing Heritage Center in Bismarck, a TR Library at or near the campus of Dickinson State University makes perfect sense. But in Medora, in the Summer, it will be an extremely expensive curiosity, and in the Winter snows and Spring floods, a major tax burden. Is a “Teddy Walmart” going to pay for that? Putin: Vladimir Putin would love Burgum’s display of Soviet style major planning for a problem that could be solved on a much smaller scale of thinking. Rasputin: And I find it incredible that among all the clever people advising the Governor, that not one of them is able, or willing, to tell him what every real estate agent knows: “location, location, location,” means Dickinson makes sense for people who care about North Dakota’s Medora. The town of Medora does not. HPR: But the “Brighter Future Fund” folks assure us that people in New York and California just can’t wait to get their hands on a TR Library, for the low, low price of $50 million from public funding. Chicago Dog: Yeah, right. And pigs can fly. New York already has a TR Museum in downtown Manhattan. What they don’t have is a Bank of North Dakota, which can make up for the stupid mistakes that occasionally starry-eyed Governors and Legislators might make. Putin: And California may have the Redwoods, but they don’t have the Badlands. Unless the Walmart Empire is willing to help Californians save the rest of their burning trees as a price of a TR Library, I don’t think that dog will hunt. HPR: Maybe Governor Burgum and the Legislature can persuade the “$100 million private donations folks” that their branding interests would best be served, along with those of North Dakota tax payers, with a full on TR Library in Dickinson, with facilities, staff, and operating budget. This would include, of course, a strong visible presence in Medora in the Summer months in the many quaint and charming venues put together by Harold Schafer’s vision and Theodore Roosevelt’s legacy. Chicago Dog: And then hope like hell that State and private sector employees can have better salaries and benefits than they could working at a Walmart.